Al's Radiator & Auto Repair Offers Auto Repair Services You Can Count On! Welcome to our Website! Since 1986, our goal has been to ensure the complete satisfaction of every single customer, while offering knowledgeable and friendly service at a fair price. We are a Bumper to Bumper Certified Service Center offering full service automotive repair, along with our full service radiator shop. We will fix what needs to be fixed, and let you know about up-coming repairs in an understandable way without the technical jargon. We will not try to sell you unnecessary repairs. We promise to always provide value and outstanding service, regardless of repair size or difficulty. We offer a 24-month, 24-thousand mile warranty on most automotive work performed! Al's Radiator & Auto Repair has established the tradition of honest, dependable, quality service without all the sales gimmicks, misleading advertising or cut-rate work, our best advertising is our loyal customer base. For a lot of people, auto repairs and are not fun or convenient. We want to make your experience as easy and enjoyable as possible. We know that you have other choices in the area and we appreciate your consideration. Our hope is that you'll feel confident in our ability to meet all of your expectations and know that our customers are always our #1 priority and focus! THANK YOU for spending the time to visit our site! Every time we've brought both our personal vehicle and our work van in, Al's Radiator has been very thorough, helpful, fair, and honest. I highly recommend them. This place just saved me $3,500. 10/10 will go back. Our pastor recommended this place when the transmission died on our van. He did an amazing job and even found a power train warranty for us that we didn't know we had! Very honest. We will DEFINITELY be going to Al's from now on. Grant does an excellent job. Very reasonable prices and he always does what he says. 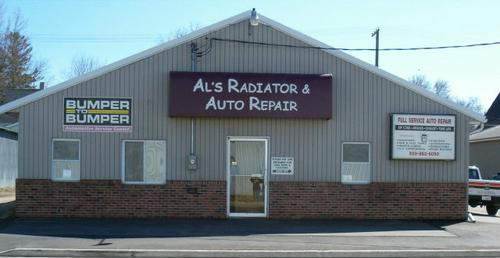 I highly recommend Al's Auto & Radiator.